With more and more bear sightings coming in, it’s hard to think about skiing and snowboarding….but you must!!! 2011 has so far been a record breaking year for snowfall and with the lower temperatures, the powder conditions are that of mid-winter. Environment Canada predicted a later spring which has so far proven to be true. Where to head? Sunshine Village in Banff National Park is still rocking with incredible snow conditions and no crowds. Even Easter was quiet this year due to it being a little later in the year than usual. Sunshine Village will wrap things up for the season on May 23 2011 with the 83rd annual Slush Cup. There is lots more going on including the Sunshine Village 3rd annual Bikinis for Breast Cancer fundraiser. The video footage below was taken in March and April this year in Sunshine Village’s backcountry. These skiers are experienced expert locals and have all the right backcountry gear so please do not imitate! Enjoy these excellent extended ski conditions and be sure to look out for bears, wolves, deer, elk and big horn sheep (to name a few) on the spring ski bus to Sunshine Village from Banff! Thanks for reading and feel free to share your spring skiing and boarding experiences with everyone below! Last one of the season! This is the final Torchlight Dinner and Ski event for the 09/10 winter ski season at Lake Louise! This party is the ultimate way for your group to wrap up a wonderful day on the slopes, or the perfect escape to the mountains after a work week. Rates: Adult $49, Child $28. Group rates (>15) and transportation to Banff or Lake Louise available. Contact rocky-peak Ski Holidays to book! 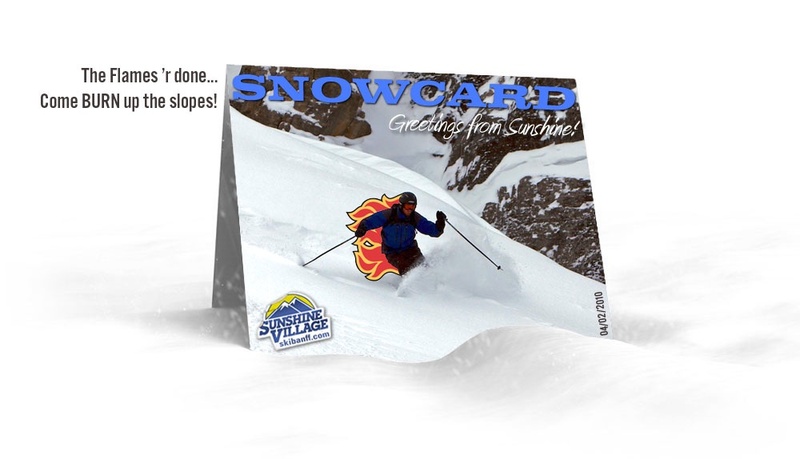 Just received the following eCard from Sunshine Village. The Calgary Flames are DONE for the season (but there is always next!). Freewheel Battle of the Boards is happening this Sunday, March 28th 2010 at Jasper Marmot Basin. The Skier/Boardercross event starts at 12 pm on Punchbowl. Registration will take place at Jasper Marmot Basin and Freewheel starting at 8 am March 28th. The event will feature a banked dual slalom followed by a mini rail jam in Terrain Park located on Lower Lift Line at 3 pm. With 50 cm of new snow in the past 36 hours Sunshine Village are currently sitting at 55 cm in the past 4 days! Goats Eye Express chair will re-open today for your skiing and riding pleasure. Visit Sunshine Village’s website at Skibanff.com to see the line-up of their weekend outdoor concerts happening every weekend until May 19th!